Ever wondered what India was like in 80AD? Well neither had Jade and Phoenix - until they ended up there for Level 4 of the game. Transported from the deserts of Egypt into the tropical heat of India, they have to face a whole new range of enemies. Snake-gods, invading armies, assassins and war-elephants are all on the list. To complicate matters, the Game is now open to internet gamers in their world - adding a whole new level of difficulty. When they meet a fellow-gamer, they are in for the ride of their lives. Somehow, they end up involved in a full-scale war between rival kings. Each army is over 100 000 strong and prepared to fight to the bloody death to hold the town of Pune. Unfortunately, it's also the town Phoenix and Jade must get to, to complete Level 4. They must return The Sudarshana to the statue of Vishnu in Pune, before the death of the moon. With two armies in the way and assassins sent by Feng Zhudai hot on their tails, the task seems impossible. Yet, if they fail, all hope of ever getting home is gone. 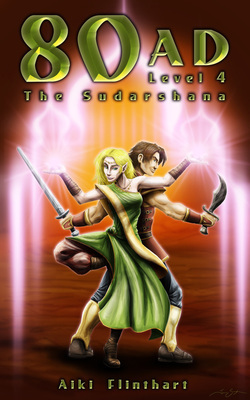 For more information on Ancient India and background to this story, go to Story Extras - The Sudasharna.